I'm in love with this styled desk I spotted last night on pinterest. My love of this picture is partly rational and partly emotional. I see that beautiful glass filled and I immediately think of my grandmother who used to drink a scotch on the rocks everyday. Johny Walker Black. This she did until well into her seventies. And the scissors remind me of her as well. She used to have a similar pair with little owls on them. Pretty cool grandma no? That is my emotional attachment to this image and the rational part- You can never go wrong with the boldness of black and gold in my opinion and a little Hermes box mixed in. Pretty, pretty bold right? YUMmers! Love the black and gold. I have gold staples that I love-I really need a gold stapler now too. that tray is a dream! thanks for the link - perfect for my entryway table! I need a gold stapler. I love the inspiration but I love your picks even more! 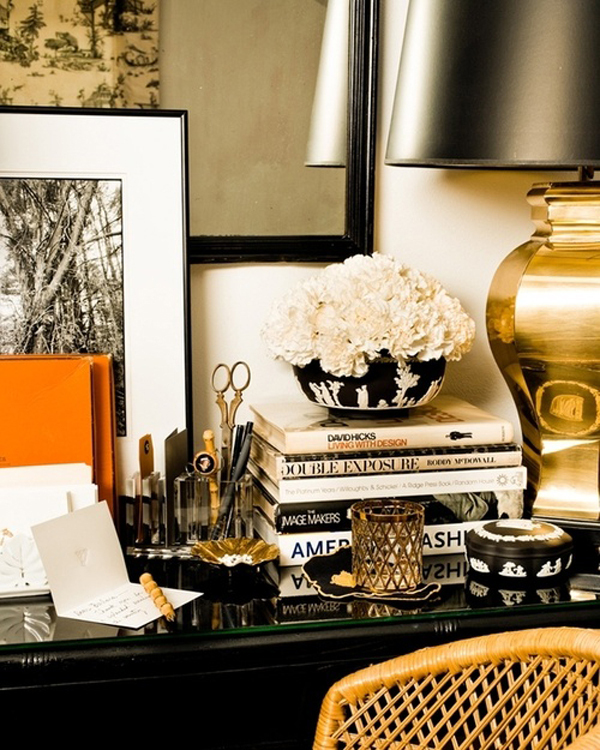 What a luxe and glamorous office! I need that note set, NOW! love love love - that tray is heaven! I am with ya...black and gold is it! My Gma had those scissors too! I love black and gold!! I have had our office done is B/W and yellow forever and now I'm just about done with all the added gold touches. I am so excited about the combo. You can find so much in that finish now. Your grandma sounds like my kinda lady!! Love the inspiration! What would we do without pinterest! All these items are to die for! Those C.Wonder glasses seriously might have to be mine. beautiful office. i might need some glassy gold scissors now, as well as all of the other accessories you've chosen. our office right now is functional but definitely not pretty enough! Gorg! Really appreciated what you shared about your emotional reaction to this image. So much of what I gravitate to in my decorating really comes from memories I've had as a child and things that remind me of loved ones. It's a subconscious way I think of keeping them with us always. I LOVE the combination of black and gold - to me it just seems so luxe! And I'm pretty sure I've never seen a stapler so stylish!! Your grandma sounds way cool! Black and gold is a winning color combination and so elegant too. Yes this black & gold office is stunning and I love all your picks too! In short I love everything!!! Oh yes girl, my Grandma drinks scotch/rocks also. And she wears a crown and her bathrobe at night and we call her Queen Helene. Anyway......I JUST thrifted an identical tray for $12 so now I need to order the scissors and stapler. Black and gold is so chic and elegant for an office and I love all of your finds. Great scissors and the box with the lion...wonderful!! Obsessed with this post. SUCH a glam office, and I love that it is equal parts feminine and masculine. Want it all. I am hands down obsessed with anything gold or black for that matter! That vignette is one of my absolute favorites, it's so perfect!! 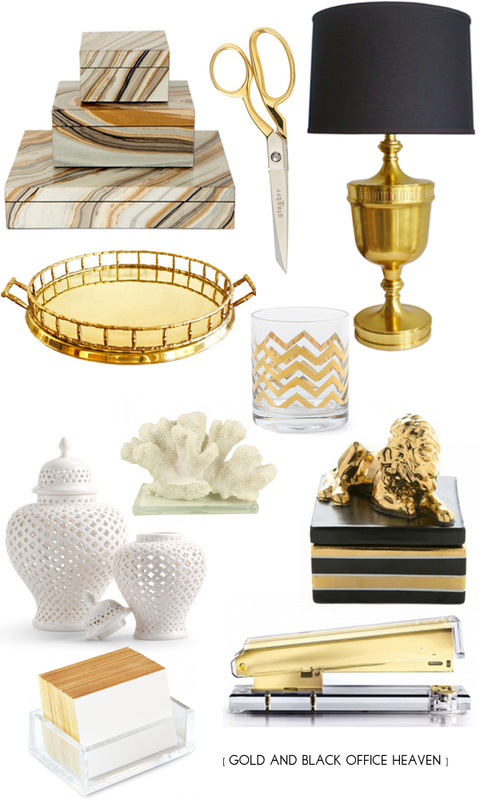 The fab lamp and lion box are my favorites!! Your selection is simply fab!!! Love it, want it need it now! I'm in love! Your inspiration pic is stunning, as is your collage! Granny knows best! What a gem. Love this. This is just what I needed! I've been trying to decide if I incorporate my Hermes boxes in my new black/white scheme. Love. Also love that touch of rattan! It's all so me.